Since the 2015-16 NHL season came to an end, talk of a trade which would send Tampa Bay Lightning goalie Ben Bishop to the Dallas Stars has provided much grist for hockey rumor mills everywhere. In Dallas, Stars fans first circled July 1 on their calendars, anticipating general manager Jim Nill would make his now-customary “big splash” on that date. While the Stars won 50 games in the regular season and finished atop the Western Conference, they did so in spite of, not because of, their goaltending. Of the 69 netminders who played at least 10 NHL games last season, Lehtonen’s save percentage of .906 puts him in a three-way tie for 55th, while Niemi’s .905 ranks 58th. In the postseason, their numbers dropped to .899 and .865, respectively. 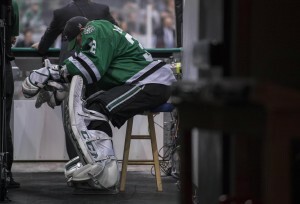 In particular, Lehtonen’s Game 7 performance against St. Louis, in which he allowed three goals on eight shots in the first period, is cause for concern. While goalies can’t win the Stanley Cup single-handedly, they can lose it. 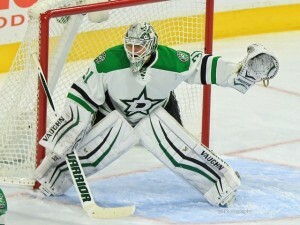 To become legitimate contenders, Dallas needs an upgrade in net. The Tampa Bay Lightning, meanwhile, are already contenders. They’re also blessed with not one, but two number-one goalies in Ben Bishop and Andrei Vasilevskiy. Of the pair, Bishop is eight years older (he’s 29, to be exact), comes with a much higher cap hit ($5.95 million vs. $925,000) and will be an unrestricted free agent next summer. Lightning GM Steve Yzerman needs to move Bishop before October, as he still needs to re-sign the trio of Nikita Kucherov, Vladislav Namestnikov and Nikita Nesterov, but has just over $8.5 million in cap space with which to work. Kucherov alone, as a 23-year-old who scored 59 goals over the last two seasons, will likely command a deal somewhere in the $6-6.5 million range. Undoubtedly, determining fair market value is one sticking point. Bishop ranks among the NHL’s elite and was a finalist for the Vezina Trophy twice in the last three years. As such, he should command a hefty return. On the other hand, Bishop only has one year remaining on his current contract, and there’s no guarantee the Stars can meet his asking price next summer. Without the cost-and-term certainty of a contract extension, Nill should be reluctant to give up too much for a player who might be a “one-hit wonder” in Dallas. Another sticking point is that, while Tampa will likely get a big return for Bishop, most of it must be in the form of prospects and draft picks, due to their cap situation. Dallas, meanwhile, would either need to send Niemi to Tampa (while retaining up to half his $4.5 million cap hit) or find another team willing to take him on. Assuming the Lightning “help” the Stars by taking Niemi as part of the package, their asking price probably goes up as a result. Conversely, having half of Niemi’s salary on the books makes it harder for Dallas to re-sign Bishop next summer. And speaking of next summer, moving Bishop doesn’t make Tampa’s cap woes go away entirely; it just ends them for this season. Not counting the goalie in question, the Lightning currently have just $2.575 million coming off the books next July 1, while contract extensions for Vasilevskiy and Victor Hedman kick in and big-ticket RFAs Tyler Johnson, Ondrej Palat, Jonathan Drouin and Andrej Sustr must be re-signed. If Yzerman can create more cap space by forcing Nill to take another big contract along with Bishop, he will. Don’t be alarmed if you’re feeling dizzy and/or nauseated at this point; Nill and Yzerman probably feel the same way. As teams will only be allowed to protect one goalie in next June’s NHL Expansion Draft, several clubs (the Lightning included) risk losing a quality netminder to Las Vegas. Faced with the choice, they would all prefer to get something in return. While none are on Bishop’s level, Ottawa’s Craig Anderson, Philadelphia’s Steve Mason and the Islanders’ Jaroslav Halak would all come with much lower price tags and provide an upgrade in net for Dallas. Another option is to acquire a talented-but-unproven goalie. After all, the Pittsburgh Penguins’ 22-year-old phenom, Matt Murray, showed that no experience is necessary to win the Stanley Cup. 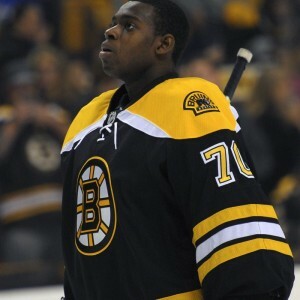 If acquired by Dallas, Malcolm Subban (BOS), Joonas Korpisalo (CBJ) or Calvin Pickard (COL) might well follow in Murray’s footsteps. Both Dallas and Tampa Bay need to make a move. Will they tango together or find other dance partners? Between now and October, we’ll find out.